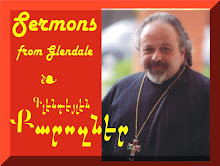 Guest Sermon: Archbishop Vatche Hovsepian offers this sermon on Fathers' Day at the Armenian Church Youth Ministries' Center in Glendale, California on June 17, 2012. On fathers, family and life. Recorded LIVE. Sermon by Fr. Vazken Movsesian, delivered and recorded LIVE at the St. Peter Armenian Church & Youth Ministries' Center in Glendale, on June 3, 2012. Why politics and religion don't mix. On finding the purpose of life. Why Rock & Roll belongs to Armenia and the original Caucasians. Armenian Language begins at minute 1:35 and English at 11:45.